As the nation comes to grips with the incarceration boom of the last several decades, sociologists, criminologists, and other experts have begun to closely examine the collateral consequences brought about by mass incarceration. Costs to the community and to the prisoners themselves have been studied, as have the racial disparities associated with skyrocketing incarceration numbers. One area that has been lacking proper investigation, however, is the impact of mass incarceration on the children of the incarcerated. Sara Wakefield, Associate Professor of Criminal Justice at Rutgers University, and Christopher Wildeman, Associate Professor of Policy Analysis and Management at Cornell University, successfully fill that void with their new book, Children of the Prison Boom: Mass Incarceration and the Future of American Inequality. The numbers are eye-opening: 2.7 million children have an incarcerated parent and one in four black young adults have had a parent imprisoned at some point in their lives. The specter of parental incarceration has become so widespread that Sesame Street has created a Muppet with an incarcerated father. Wakefield and Wildeman start their analysis by positing a simple but accurate test to determine whether a given event influences inequality: 1) the event is common; 2) the event is unequally distributed; and 3) the event results in negative outcomes. 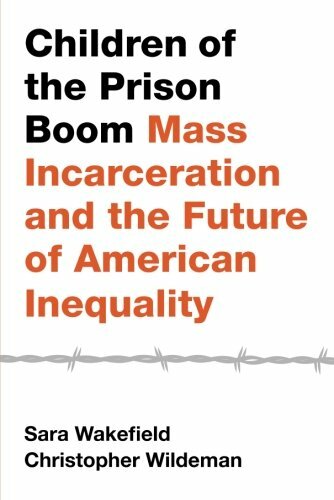 The remainder of the book is spent analyzing reams of data from hundreds of studies in order to determine whether mass incarceration influences inequality among the children of the incarcerated. The careful and thorough analysis provided by Professors Wakefield and Wildeman reveals an answer that will not surprise most: It does. The first two prongs of the inequality test are easily met in this context. Parental imprisonment is sufficiently common and unequally distributed across racial lines such that it can increase inequality if it does substantial harm to the children of the incarcerated. Wakefield and Wildeman spend several chapters examining the question of whether parental imprisonment—generally paternal imprisonment—does substantial harm to children. Several areas are considered, including behavioral and mental health problems, infant mortality, and childhood homelessness. Examining all available data, the authors conclude that parental incarceration directly increases mental health and behavioral problems in children. Wakefield and Wildeman also come to the startling conclusion that parental imprisonment increases the risk of infant death, which is clearly substantially harmful. Finally, the authors determine that recent paternal incarceration is strongly linked with child homelessness. Indeed, when statistically isolated, high-risk black children suffer a massive increase in the likelihood of homelessness when a parent is imprisoned, especially a father. Having established that parental imprisonment is common, is much more likely for a black child to experience, and is harmful to children in several ways, Professors Wakefield and Wildeman propose several possible solutions to this problem. First, they propose that substantial investment should be made in educational opportunities, social welfare programs, drug treatment programs, and work programs at the national and community level. Similarly, crime reduction and diversion strategies should be explored and implemented. Finally, the authors suggest that sentencing policies should be revisited, with a focus on flexibility instead of rigidity. Interestingly, the authors believe that the traditional approach of in-prison programming, such as parenting classes, drug treatment programs, and mental health programs, should be abandoned, arguing that prison is not the place to solve problems that have their origin outside of prison and have little to do with crime. Professors Wakefield's and Wildeman's scholarship is excellent, important, and timely. As the citizens of this country struggle with the long-term consequences of mass incarceration, the exact nature of those consequences must be made clear. The policies that have gotten us here have also led to increases in racial inequality and harm to the innocent victims of criminal justice policies: the children of the incarcerated. The question is: What will we do about that?